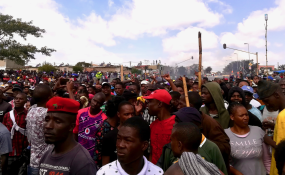 Thousands of residents of Alexandra in Johannesburg shut down the township on Wednesday morning. Asked if it is possible that some of the protests are instigated by political parties for political gains ahead of the election, as alleged by the DA, economist at Municipal IQ Karen Heese told News24: "It is possible - even if it is not directly intended, politicking is likely to raise unhappiness in certain communities; the issue is whether there are valid concerns that political parties may or may not be galvanising support around." Municipal IQ managing director Kevin Allan said: "As was widely anticipated, protests have surged - to a new record for the first quarter. It is likely that protesters are making the most of the opportunity to draw politicians' attention to their grievances in the run-up to elections." "There is noteworthy pressure on Eastern Cape municipalities - not only in Nelson Mandela Bay's communities, where repeated protests have taken place, especially in Motherwell, but also further afield, in towns like Steynsburg and Lady Grey," Heese said in the statement.